"2012 Olympics in London - won men's doubles silver medal"
"I began when I was 6-years-old in Odense. My whole family played the sport, and some still do. I like being a badminton player because I get to work in what I like most." "Winning the 2011 All England 2011 and the 2011 China Open. The All England is also my favourite tournament - the conditions are perfect, many spectators, a lot of good restaurants, close to home." 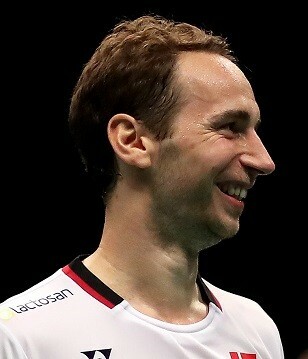 "Was nominated for BWF Male Player of the Year in 2011, and the biggest sports prize in Denmark 2011 (BT Gold)"
"There are still a lot of big titles to win!"